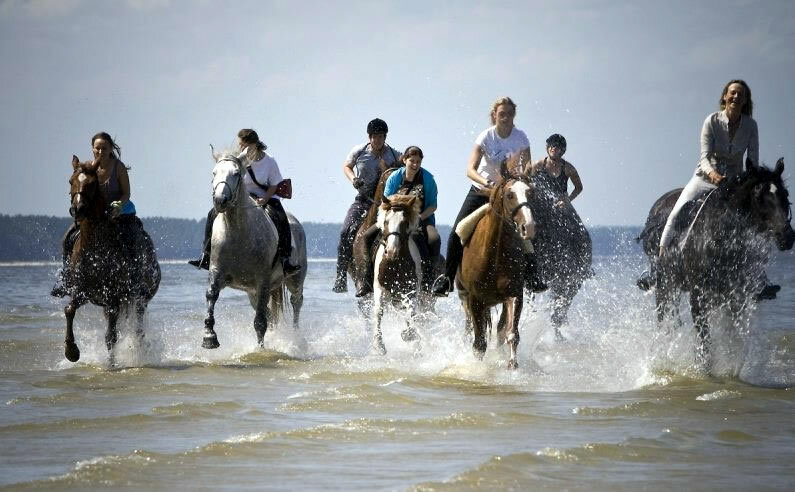 People without riding experience can also ride. 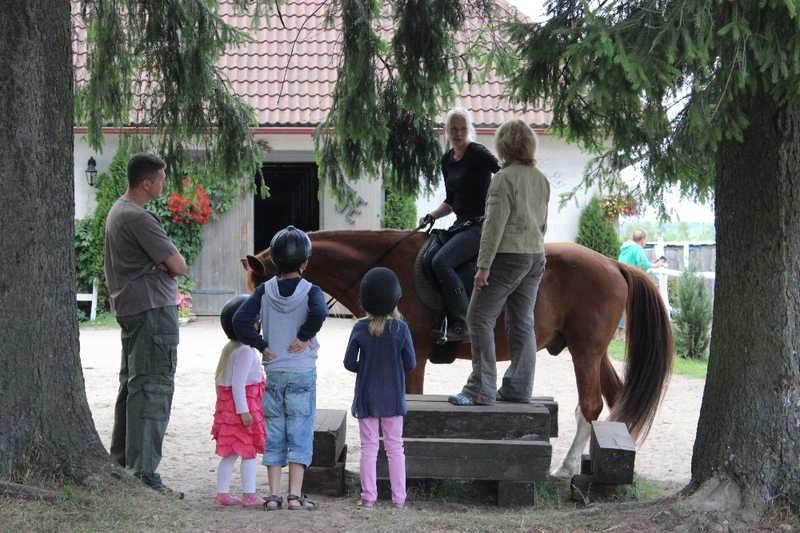 Before the ride our instructors will show you the basic things about horse riding. 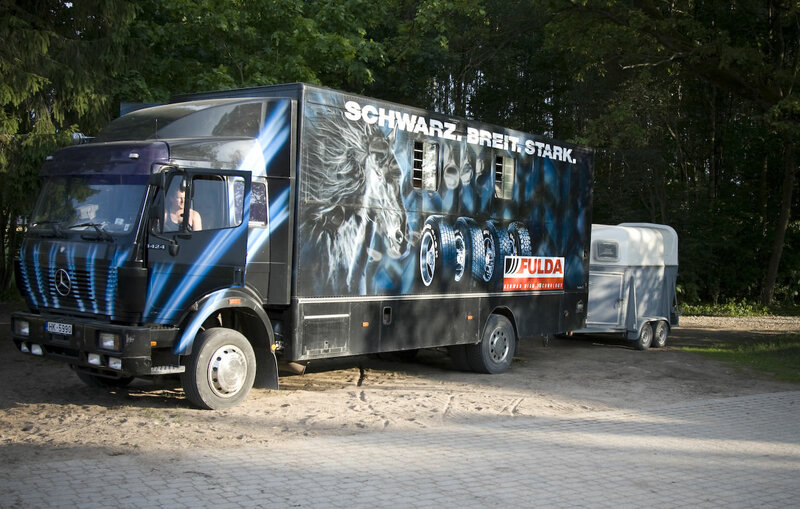 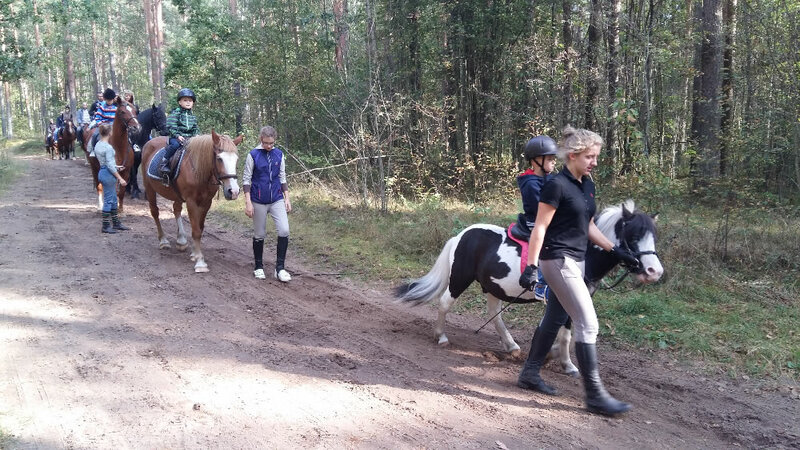 Also our horses are specially prepared for beginner riders. 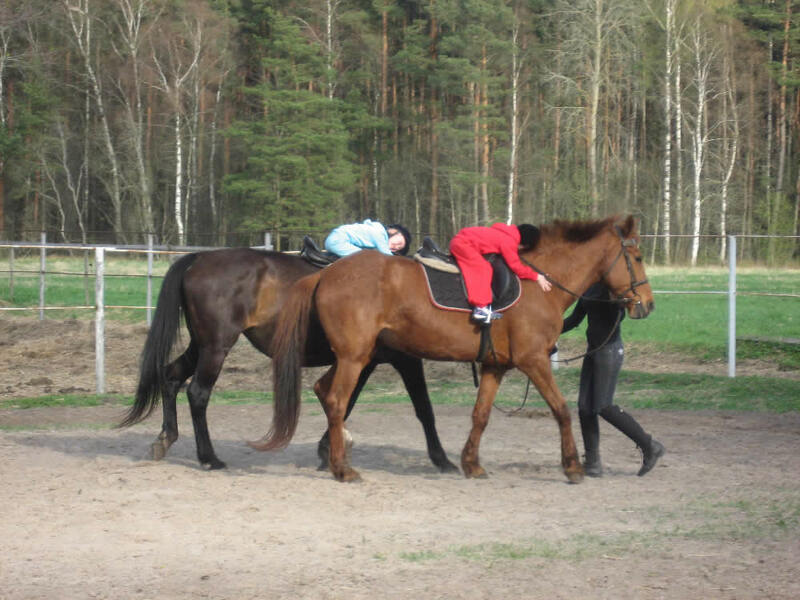 Usually our rides are one-hour long. 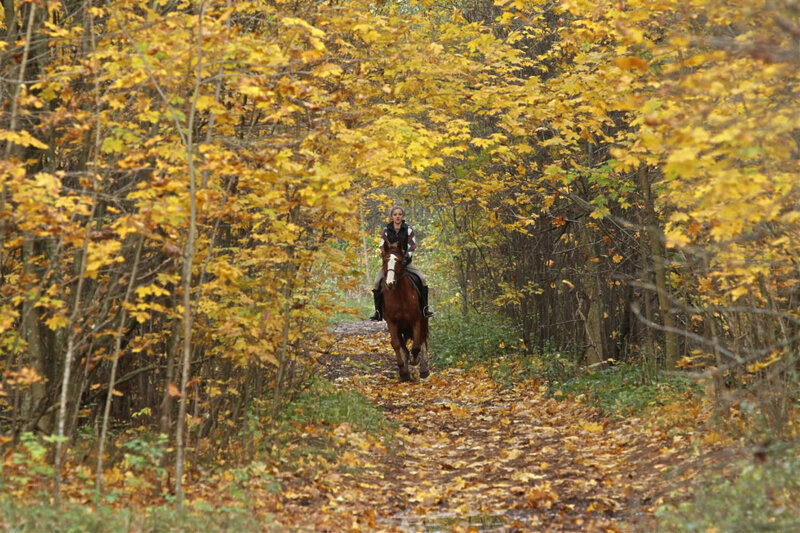 The riding takes place in a beautiful forest and meadows. 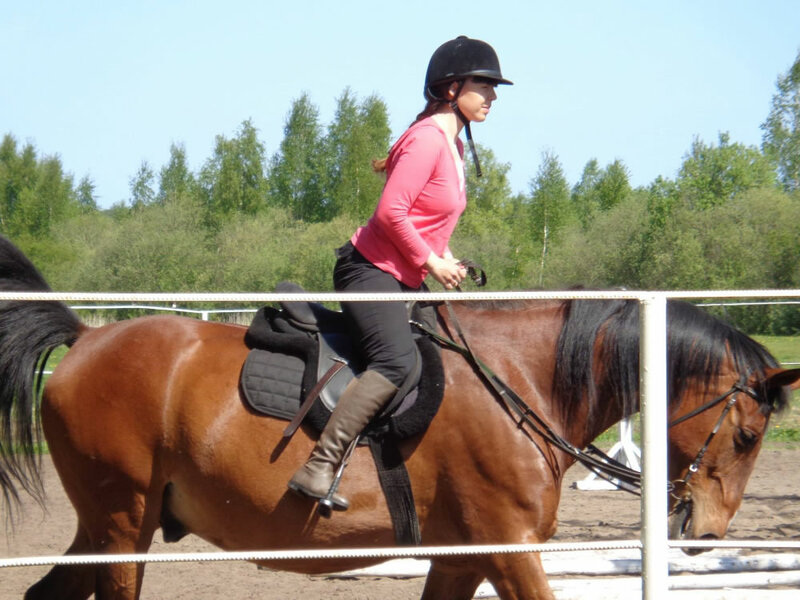 The ride will be led by the instructor. 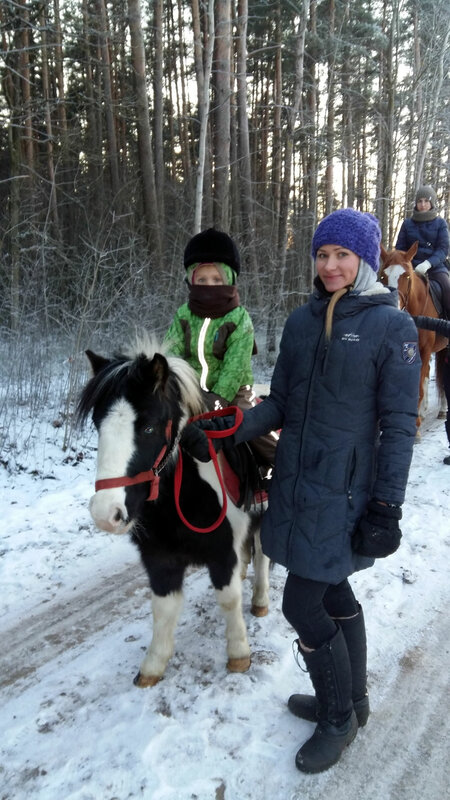 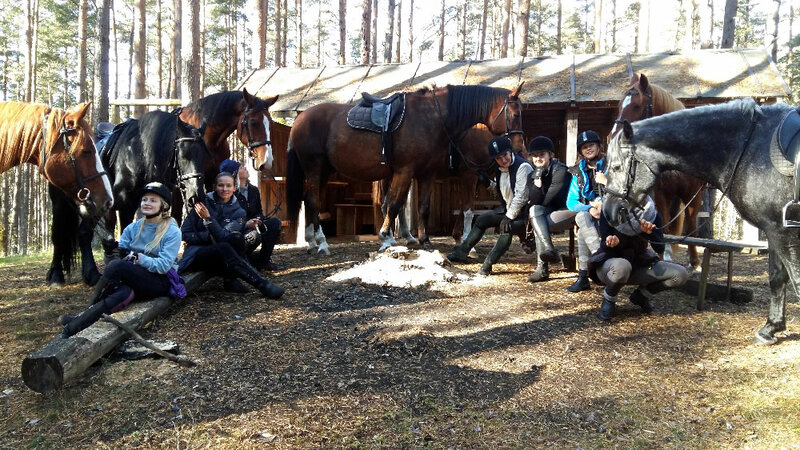 At the same time, we can offer 15 horses, that means that, you can make a group up to 15 people, so you can come with your friends and family. 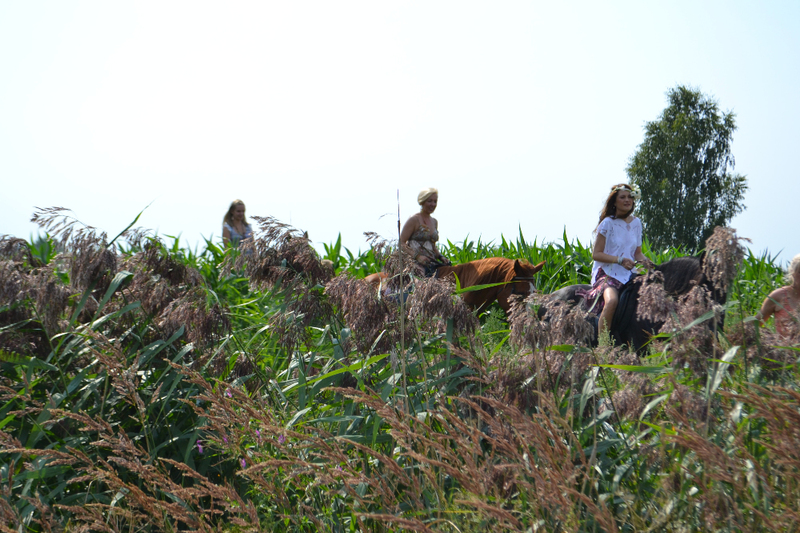 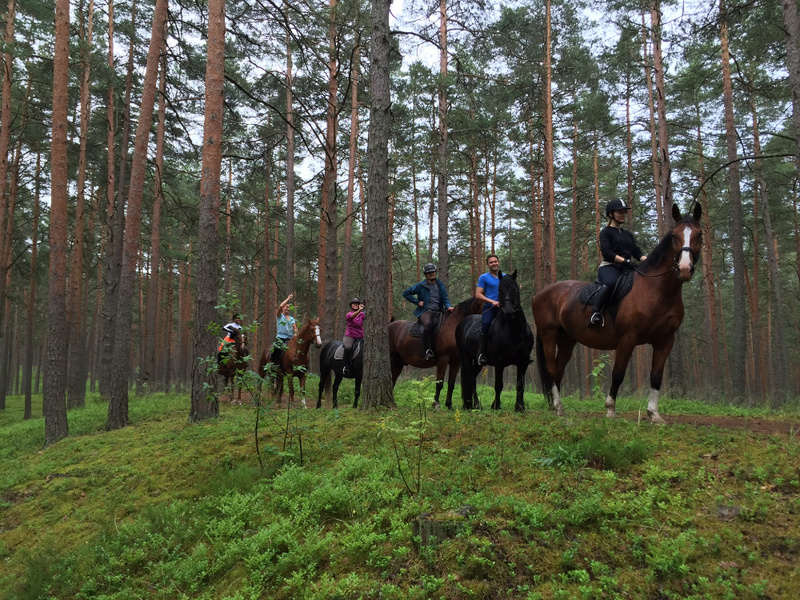 Experienced riders can enjoy the ride trotting or galloping throw the forest and meadows. 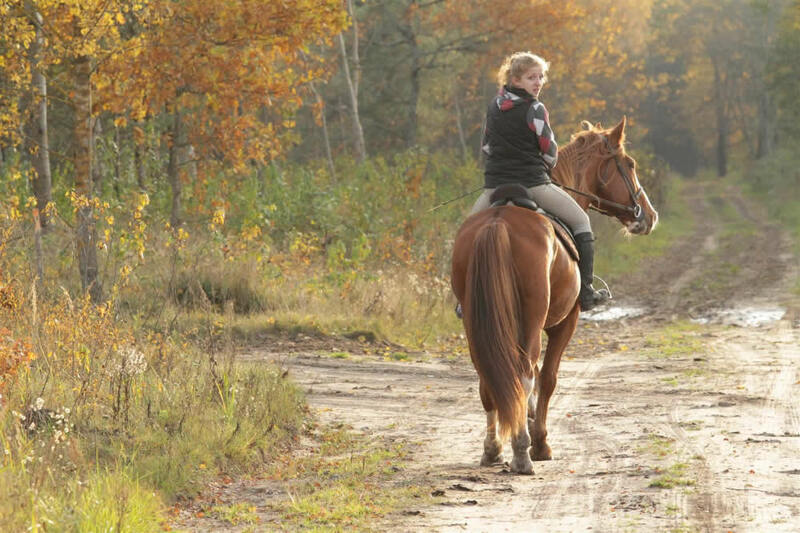 Of course, before the ride we will make sure, that the rider has good skills and knows the basic things. 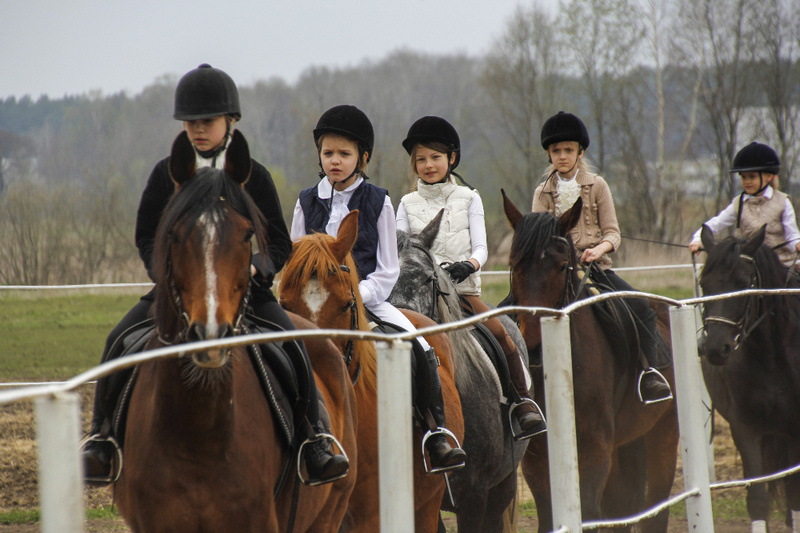 The ride is always led by the instructor. 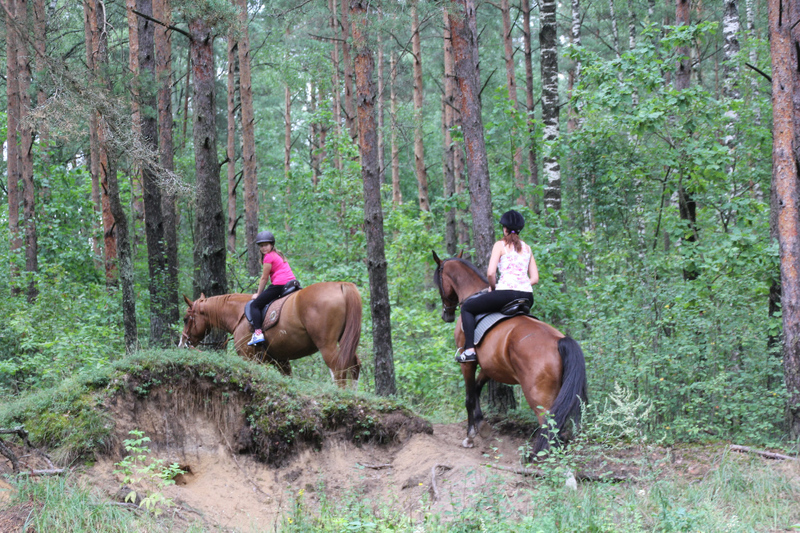 Usual ride is an hour long, but we can also make longer tracks by agreement. 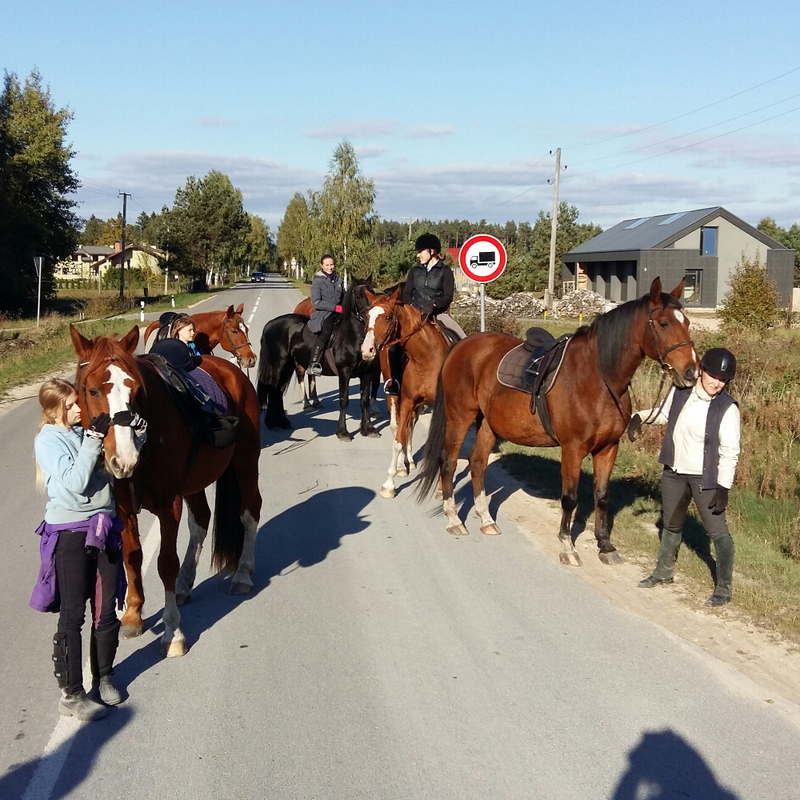 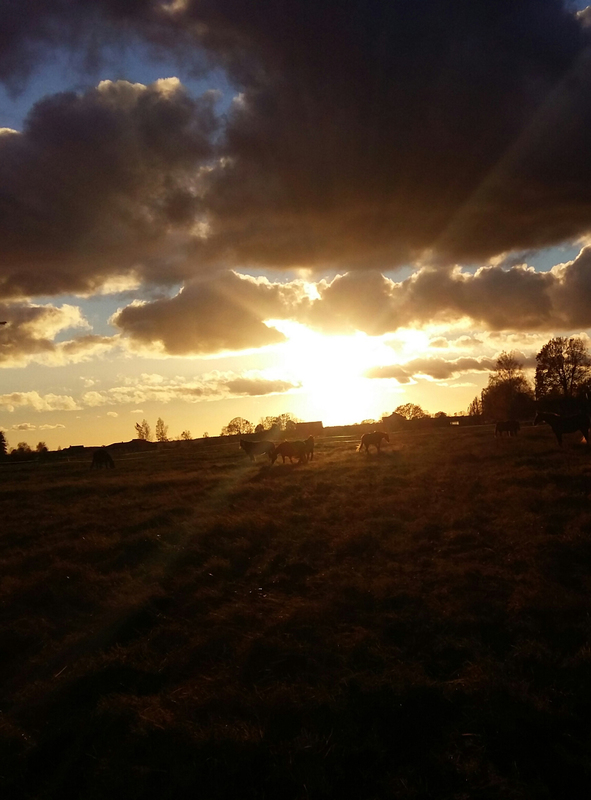  At the warm season, we offer more than one day long rides (2-5 day). 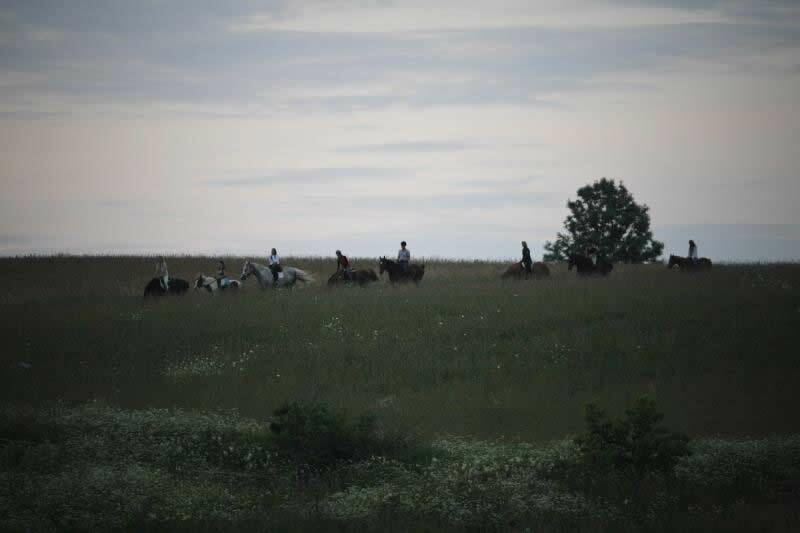 Five hours is the maximum we ride in one day. 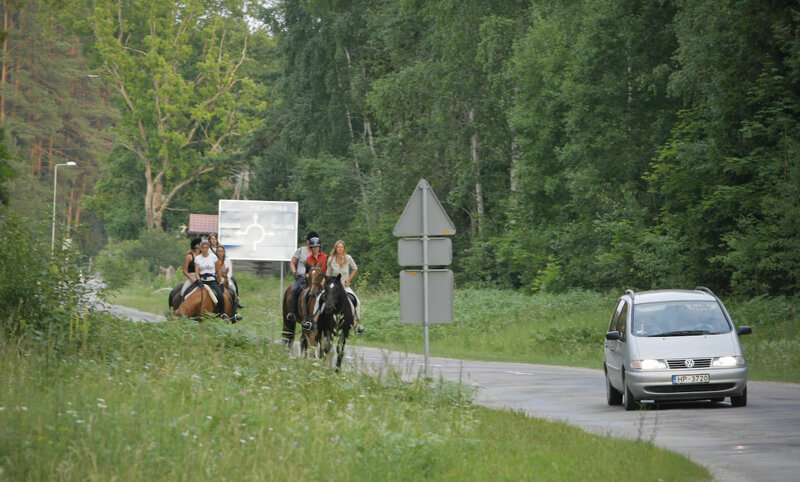 At the long rides participants must be with experience and basic knowledge. 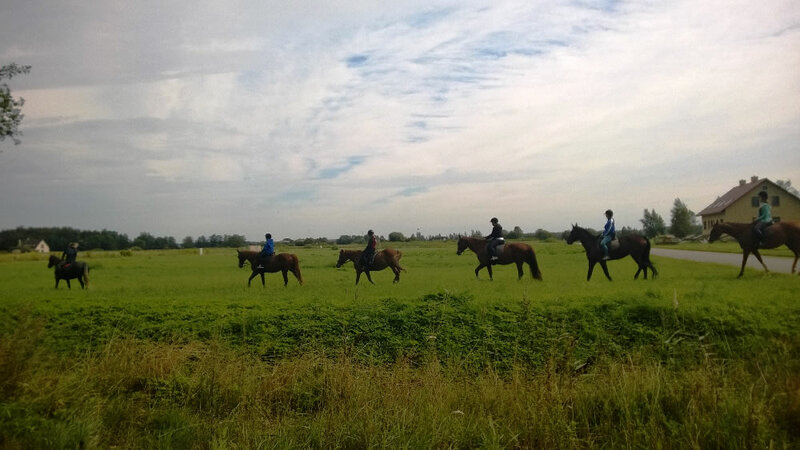 We can also offer overnight stay at guest house near the stable, at the bath house or in tents. 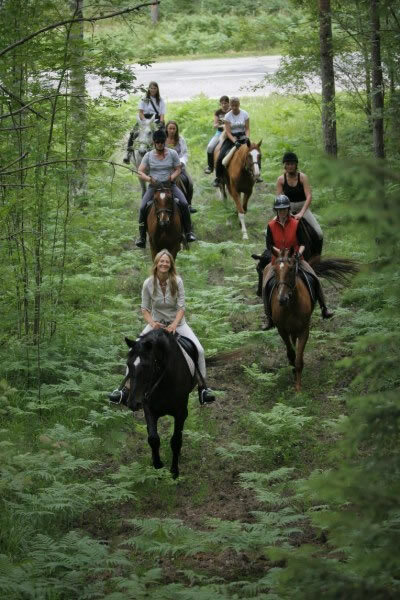 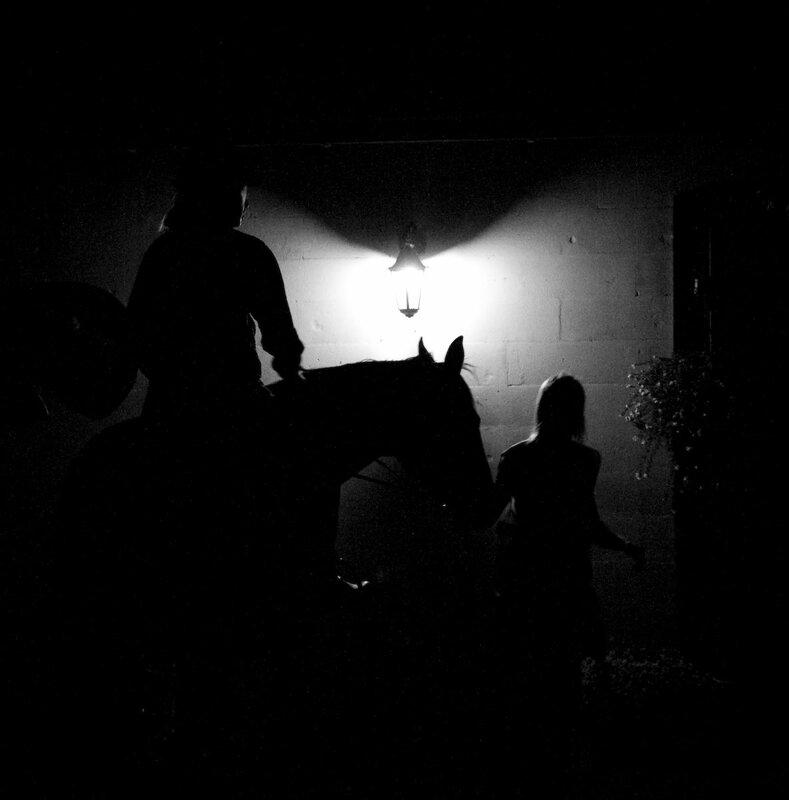 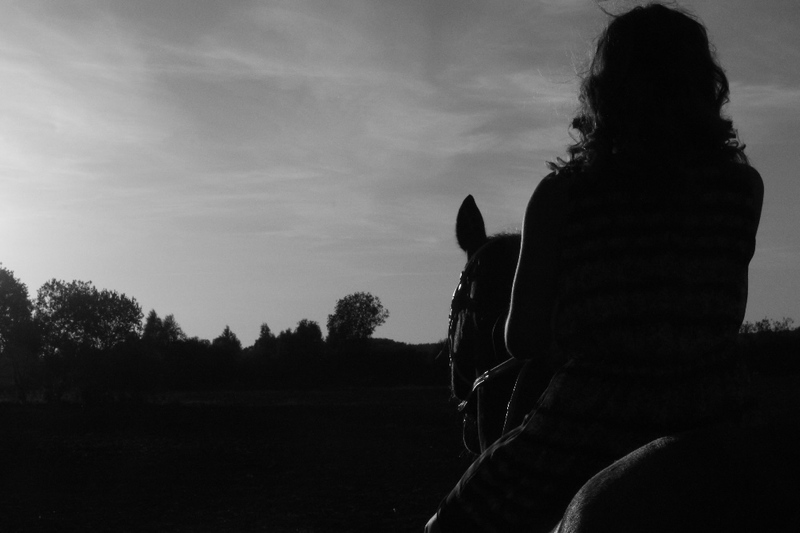 For experienced riders, we can offer horseback riding at the moonlight or organize a ride at the sunset or sunrise. 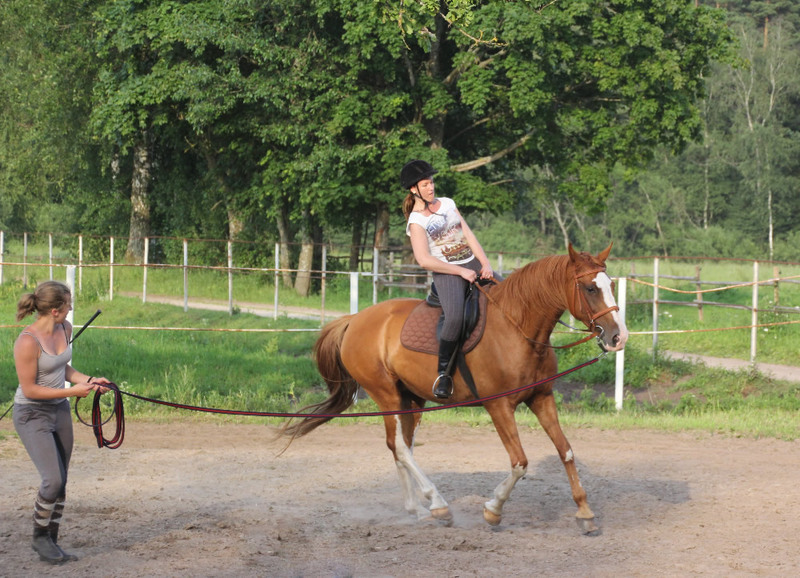 That is a very magical and beautiful moment. 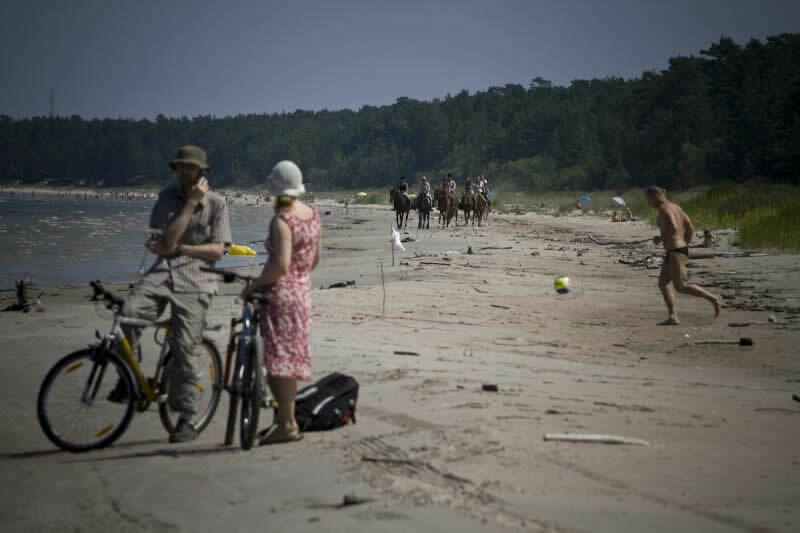 Also we can make longer rides with a picnic in the forest, galloping next to Riga airport, while airplanes are taking off upon our heads. 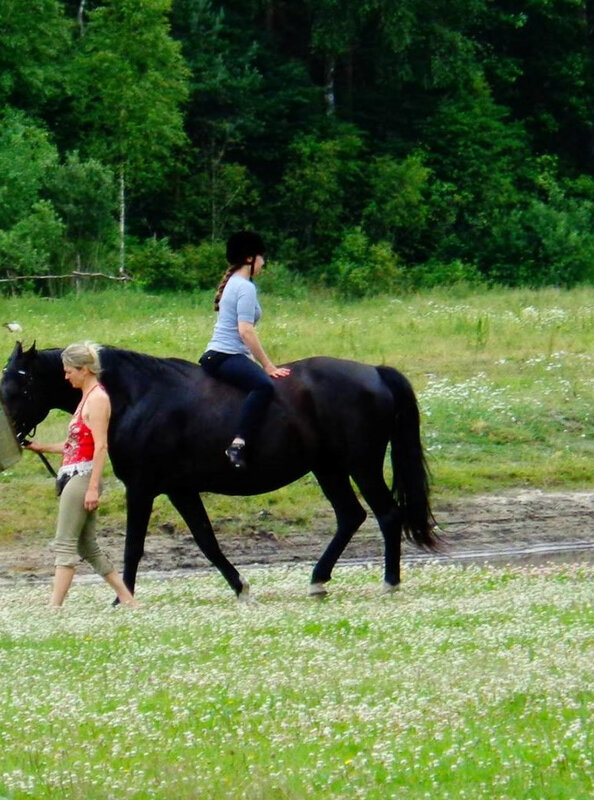 For beautiful landscape lovers, we can offer riding track next to the Black lake meadow or Beberbeķu national park. 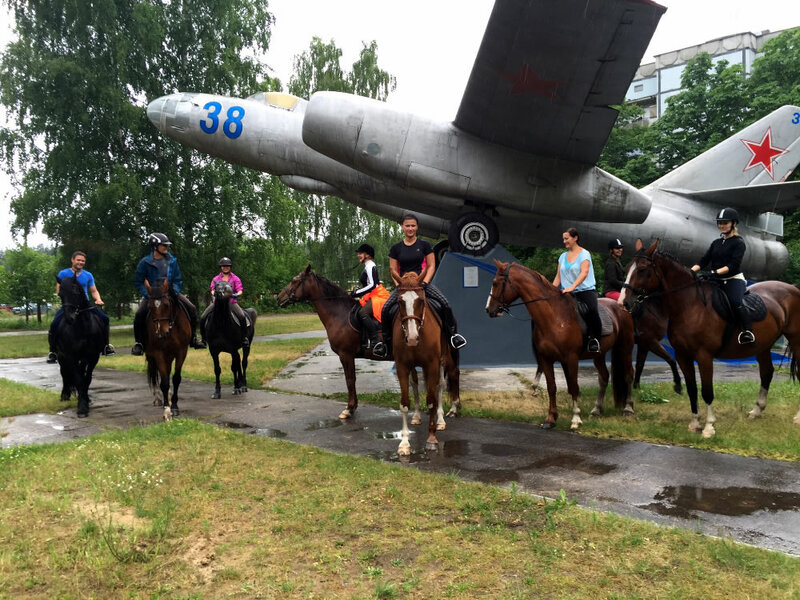 For military object lovers we offer a track that goes next to USSR jet bomber IL-28 monument in Skulte. 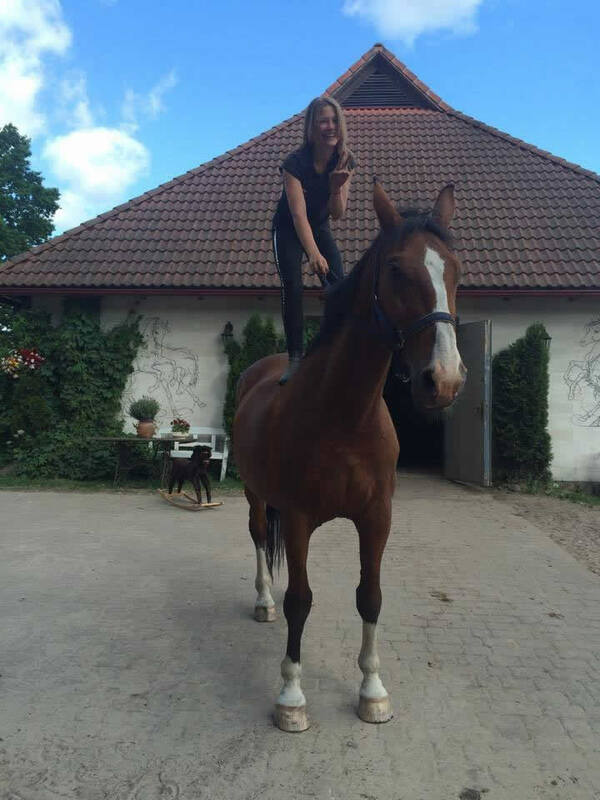 Also we can go to the highest point in the local area- helicopter landing pad. 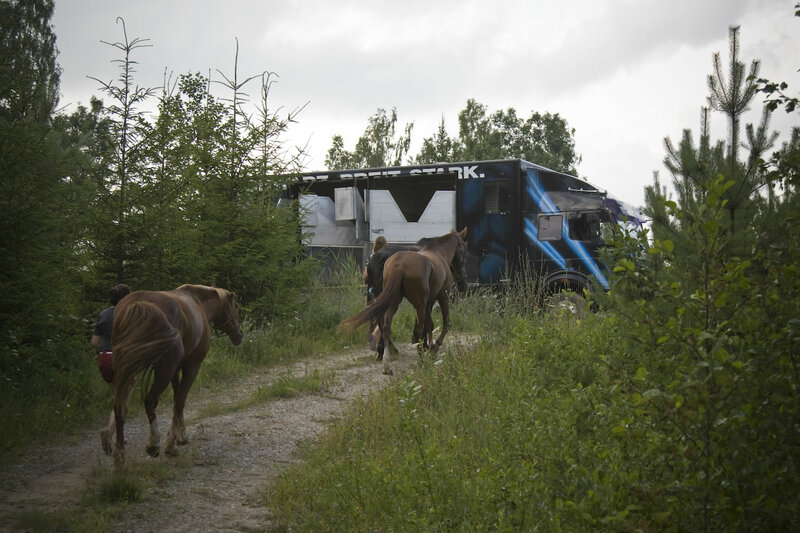 In the former USSR closed army area are also many bunkers. 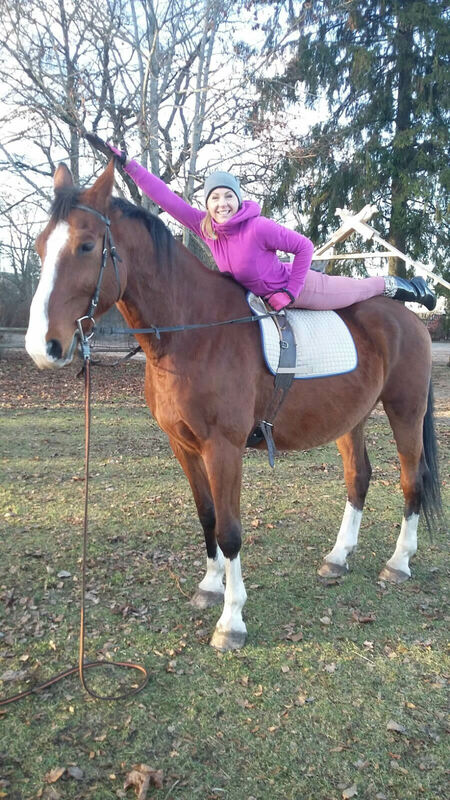 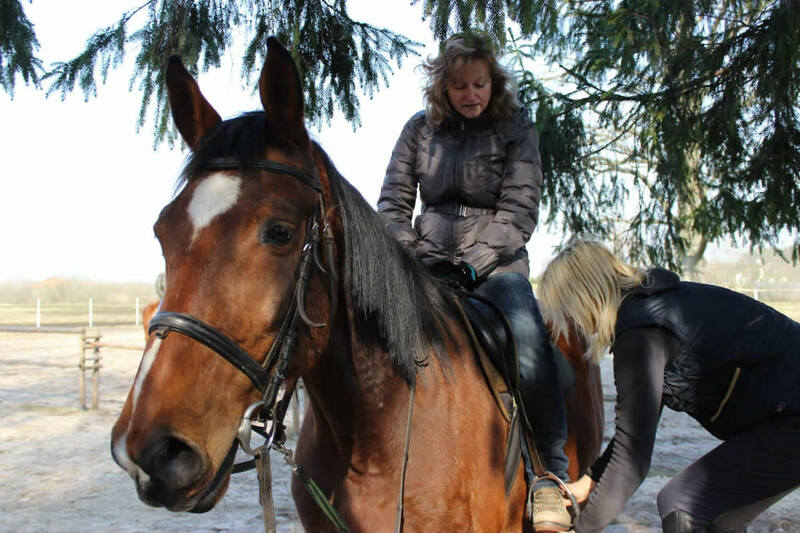 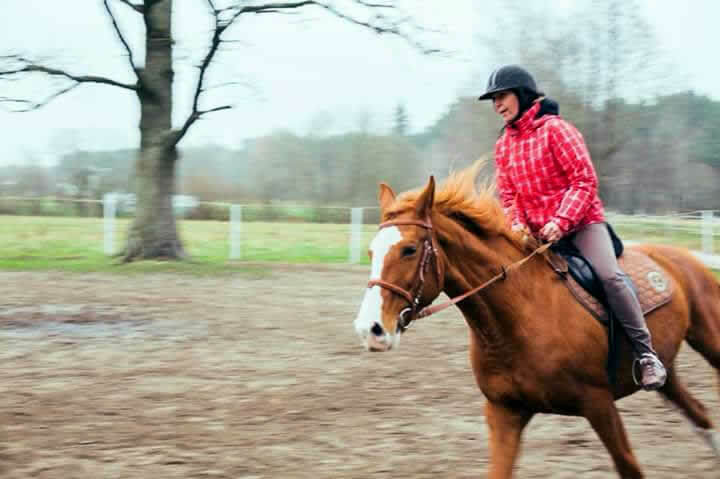 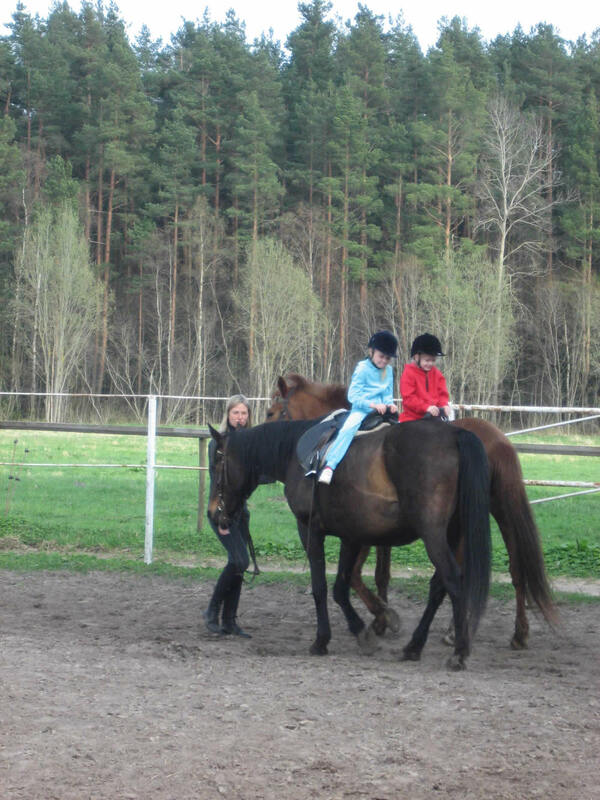 For those who want to learn about horses, riding and improve their knowledge, we offer individual riding lessons. 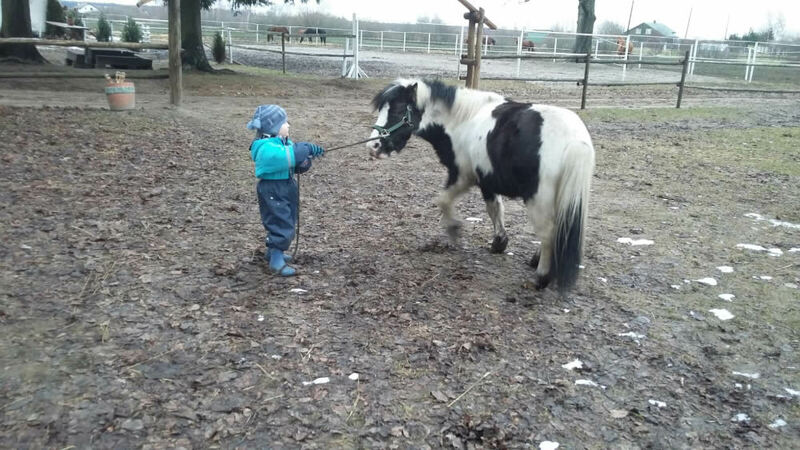 Lessons can take place in any weather. 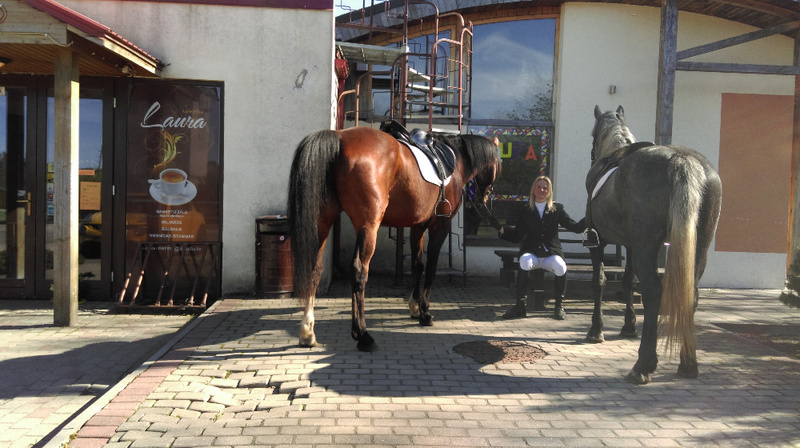 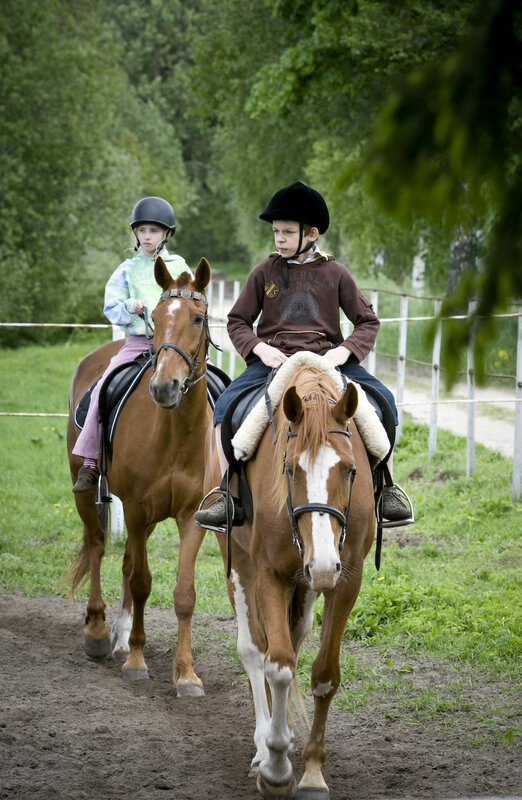 We have a closed riding area for your comfort- manege. 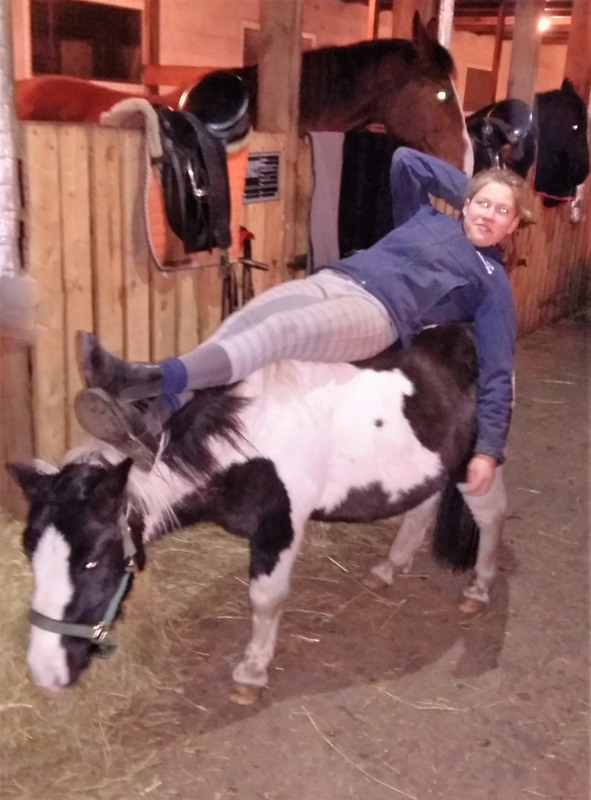 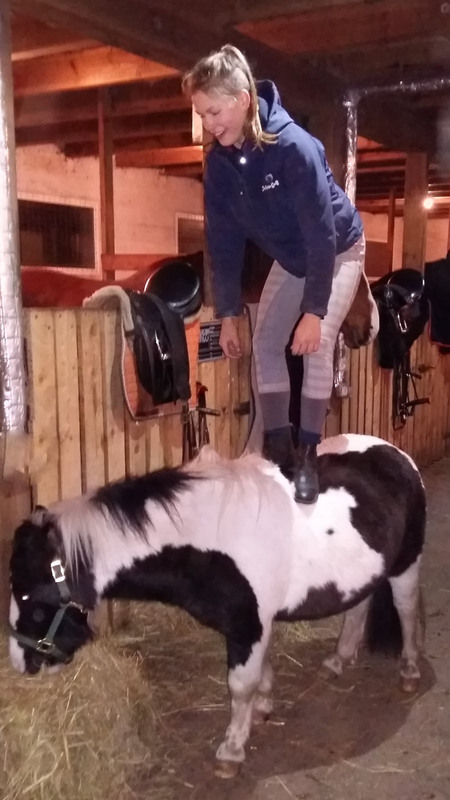 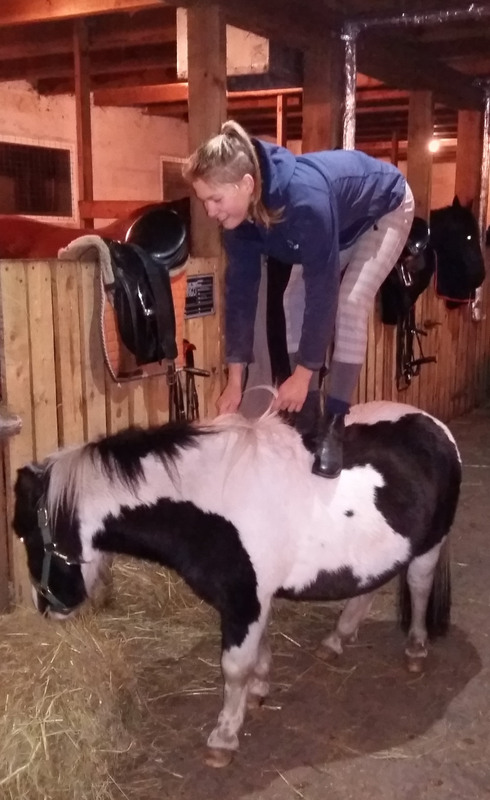 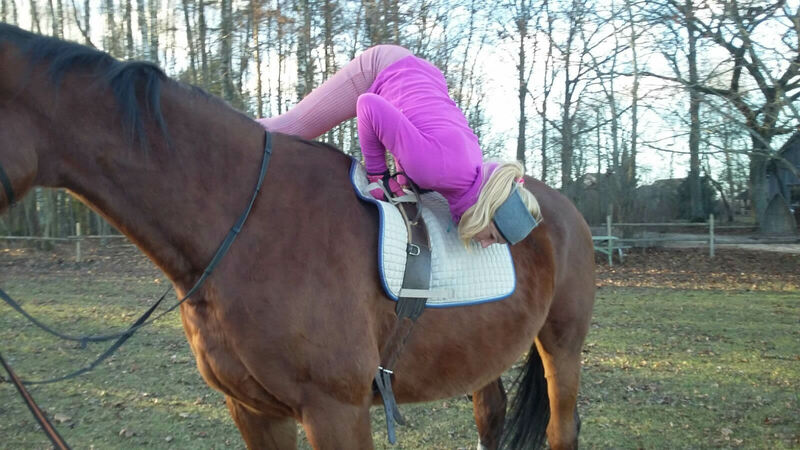 To get a good balance on a horse or just to improve your gymnastic skills, we offer vaulting. 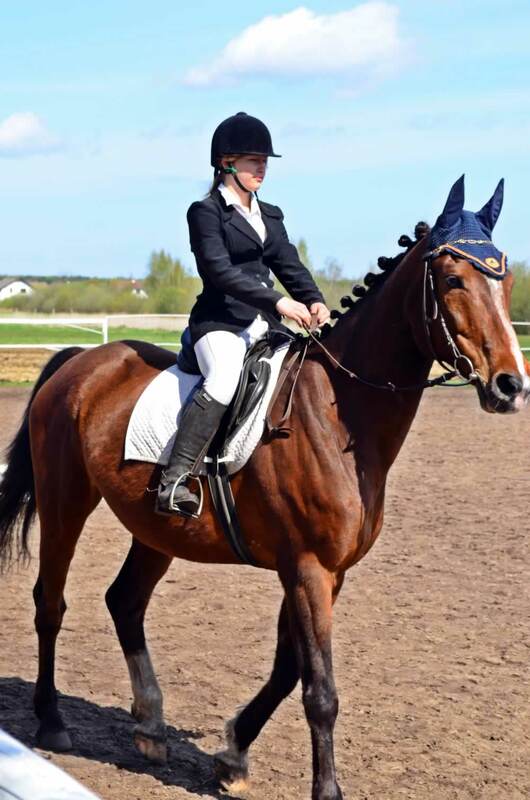 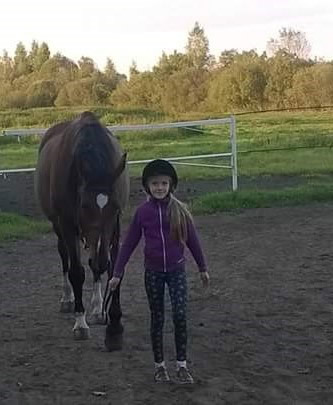 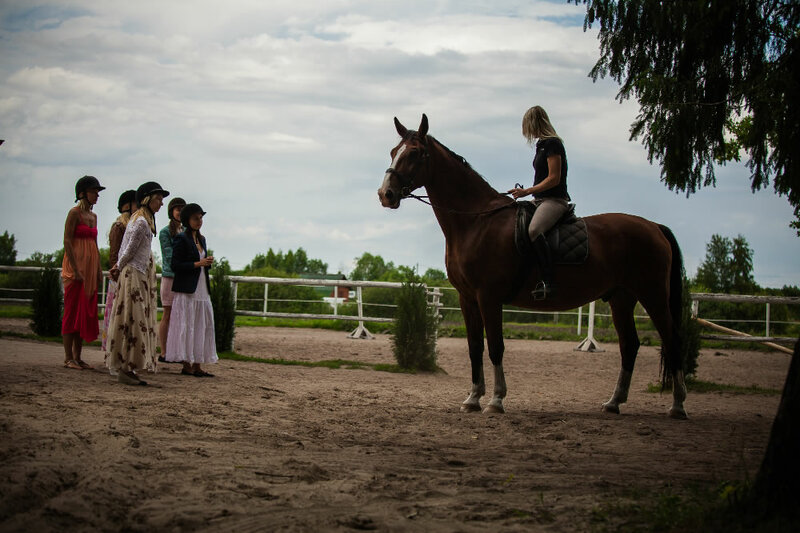 It is not only exiting and interesting, to do gymnastic exercises, when the horse is standing or walking, but also very valuable for your riding. 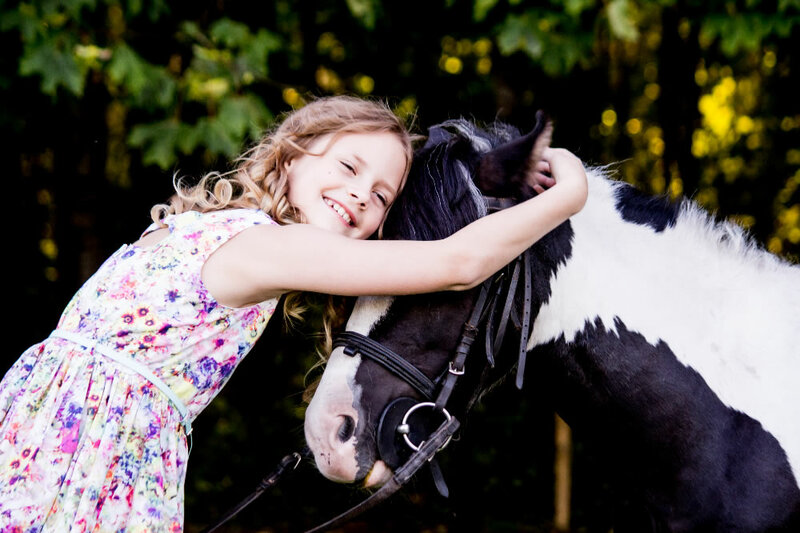 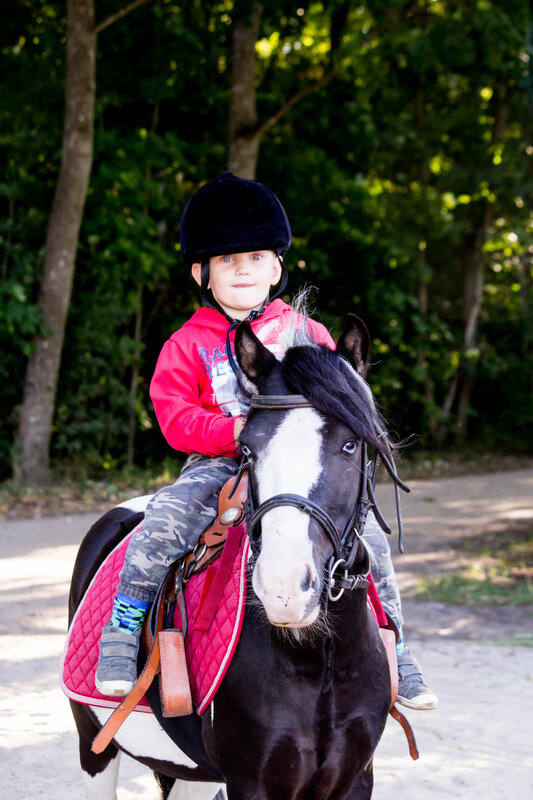 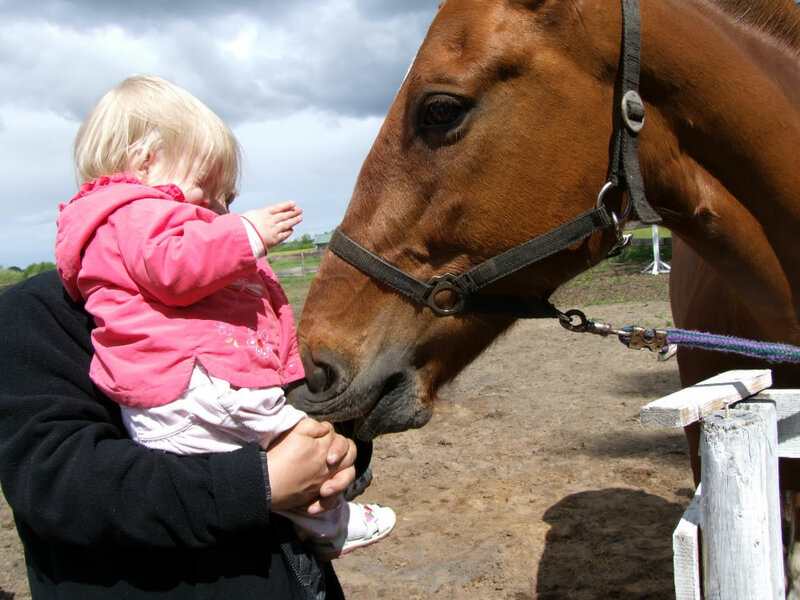 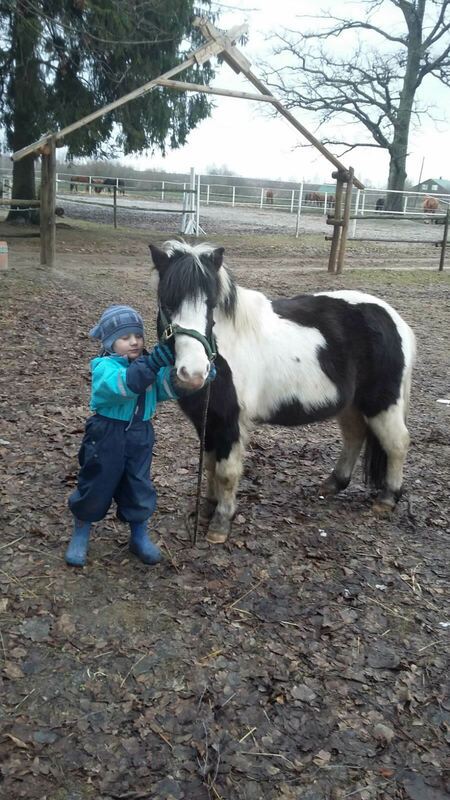 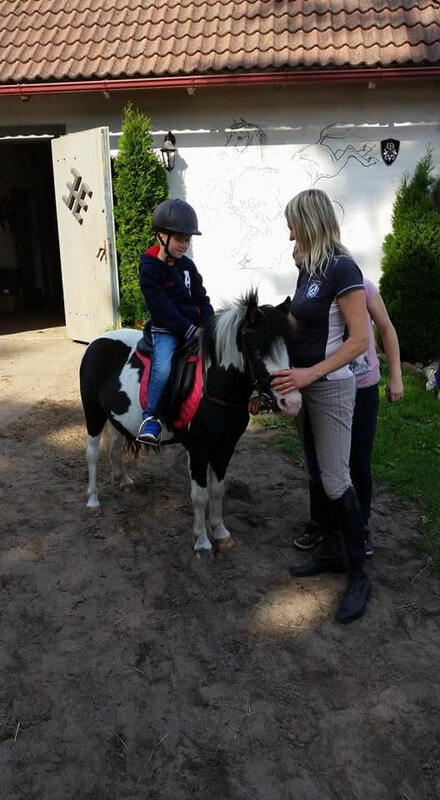 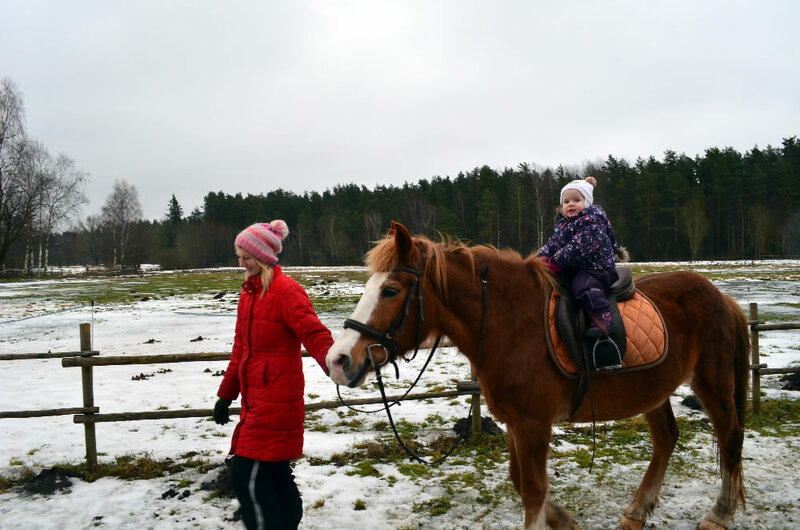 Children up to 2 years can ride together with their parents on a same horse, but for older children we can offer smaller sized horses or a pony. 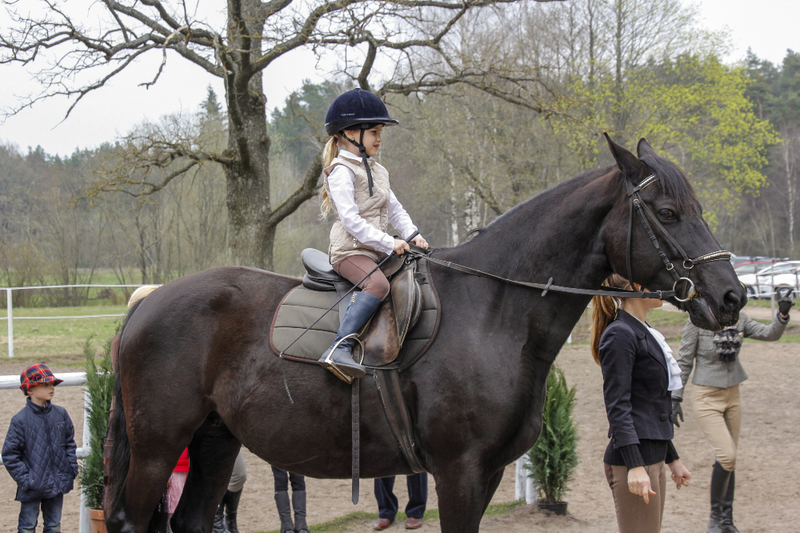 Although usually children prefer to ride with the big horse. 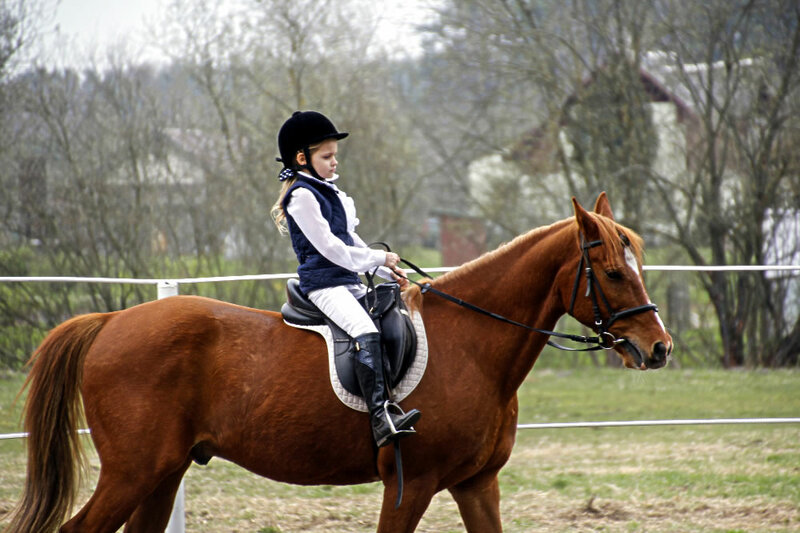 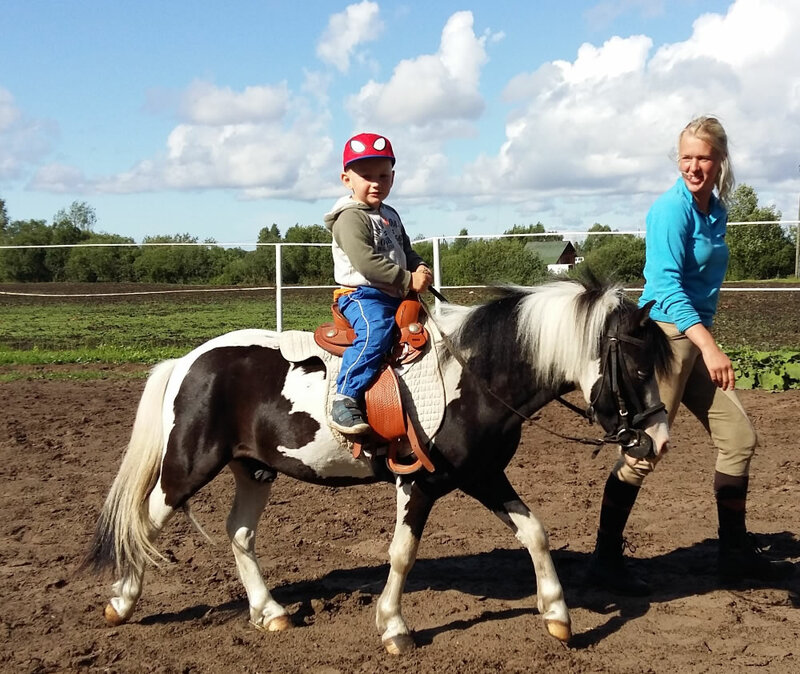 It does not matter if you take a horse or a pony, the instructor will always hold and control the children’s horse. 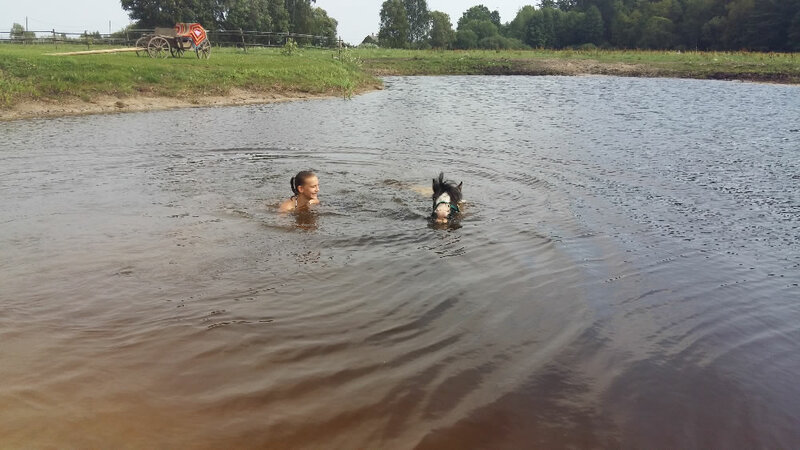 Warm summer day extra is an opportunity to swim with the horses. 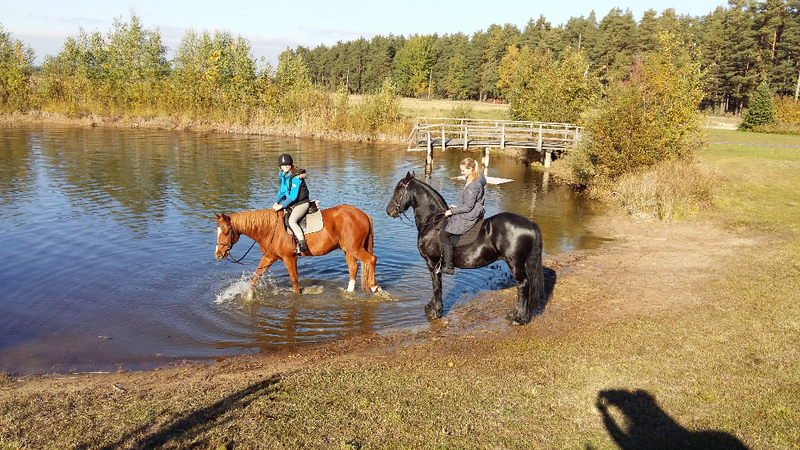 We can offer swimming in our pond next to the stable or we can organize a ride (about 2.5 hours) to the nearest lake. 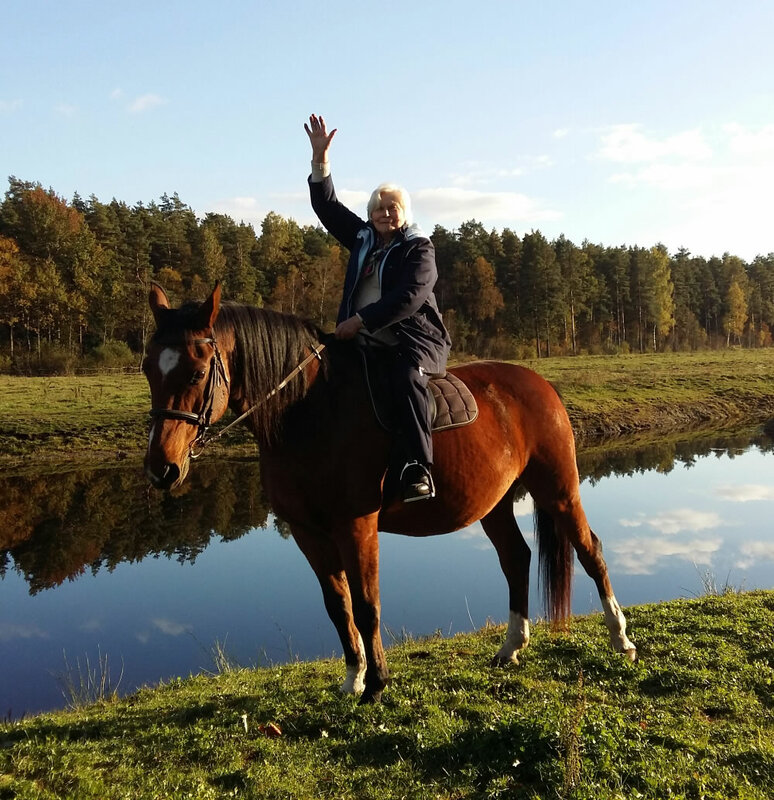 Any aged rider can go on a ride. 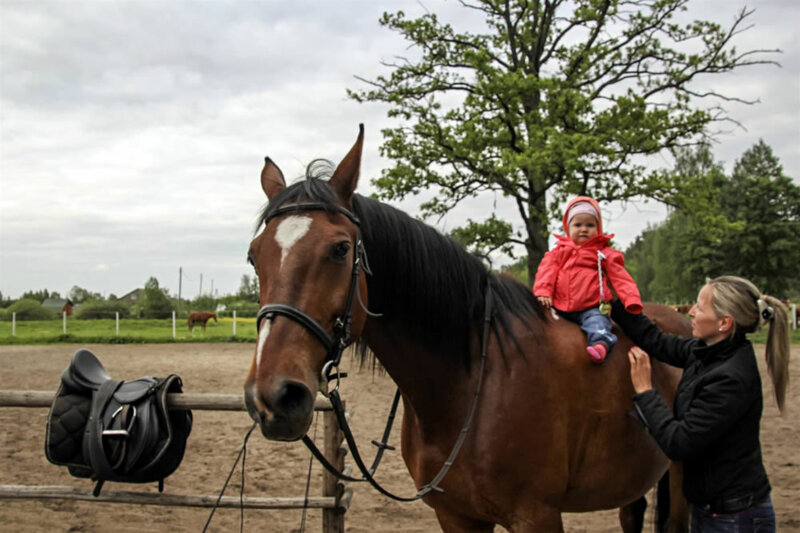 Our smallest rider was only 9 months old, but oldest rider -more than 80 years. 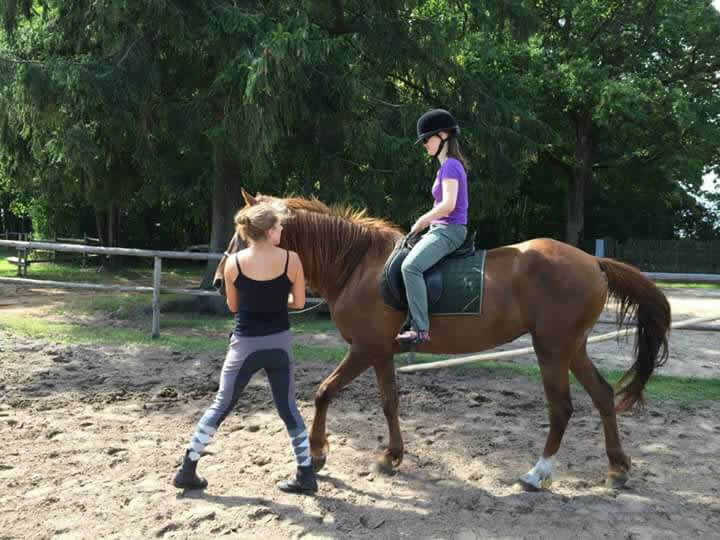 For those who are afraid, our instructor will go next to him. 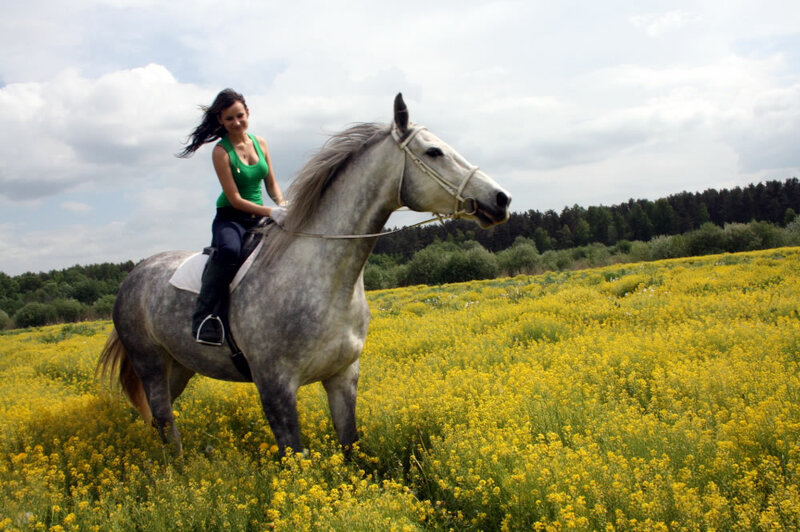 When you are planning to go on a horseback riding track, you need to dress as if you are having an outdoor leisure. 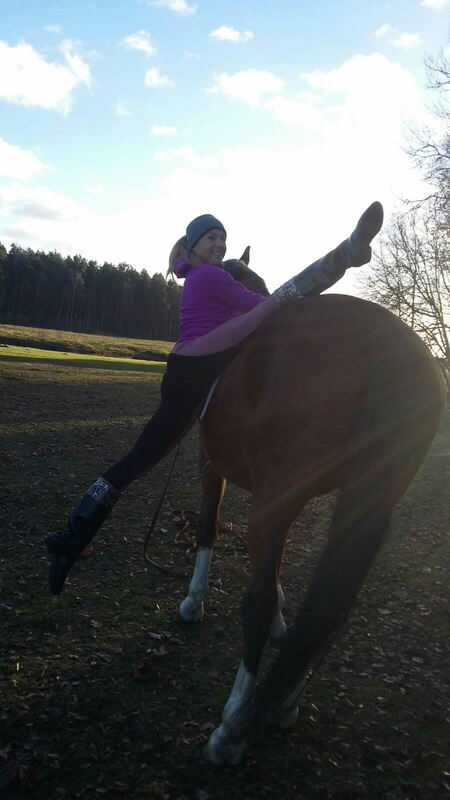 It is important that you don’t have high-heeled shoes or slippers. 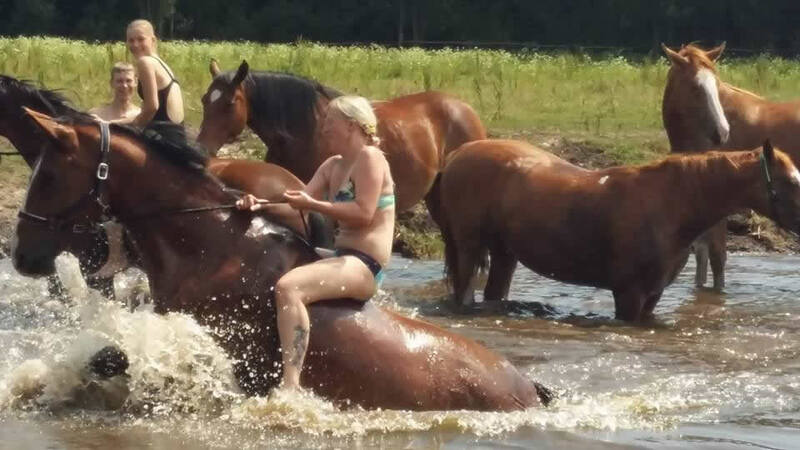 At hot summer days, it is not recommended to wear shorts. 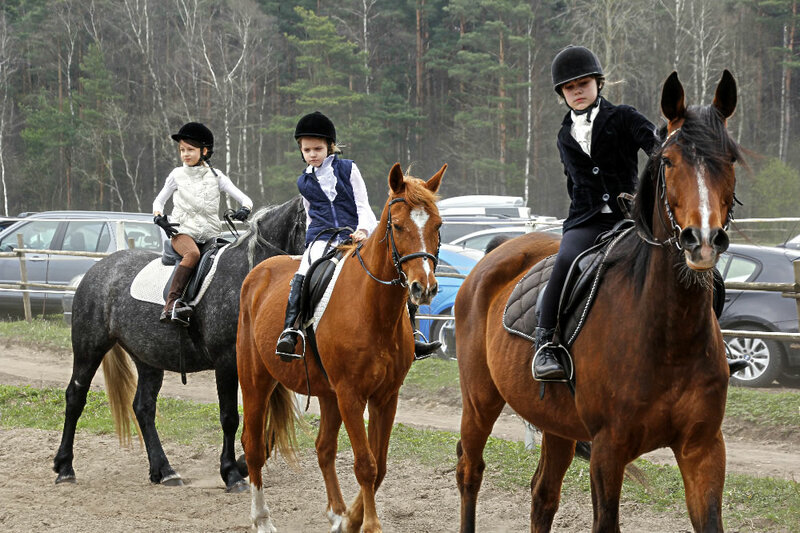 Helmets are included in the price. 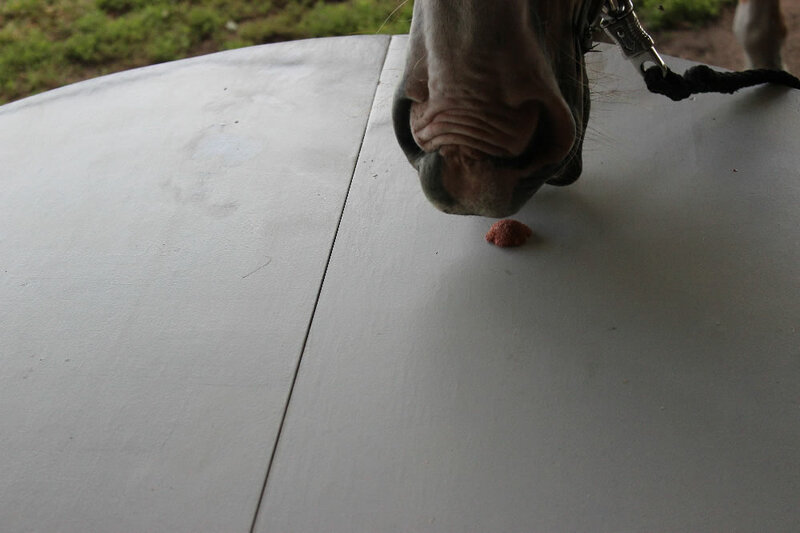 It would be nice if you bring some treats for the horses. 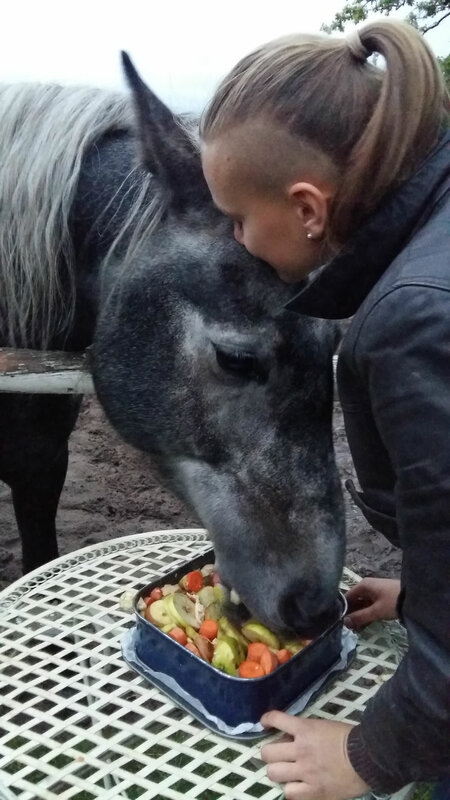 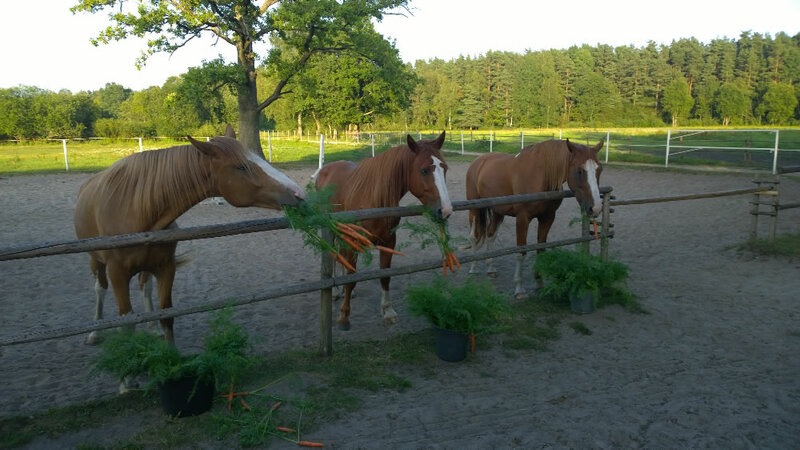 You can bring carrots, apples, beetroot, dried bread, sugar cubes or special horse treats. 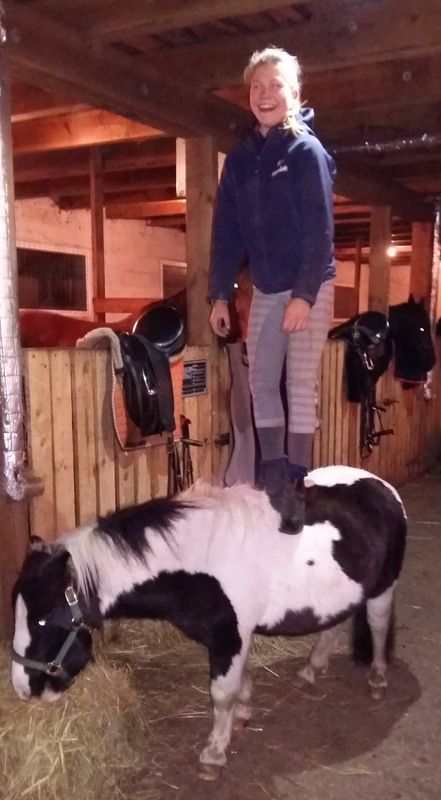 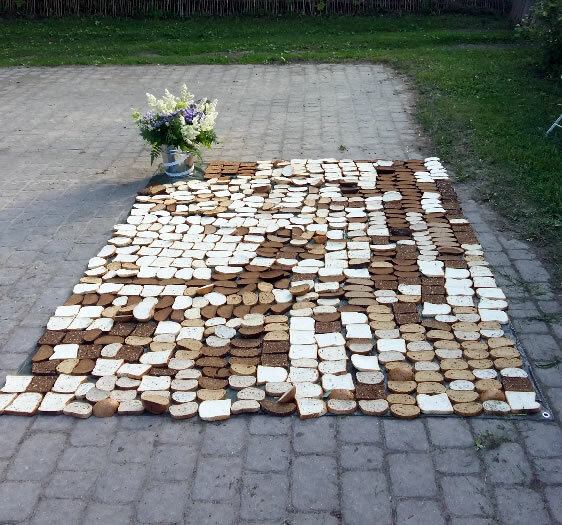 Horse will appreciate it.